Erbil, Kurdistan Region, Iraq (cabinet.gov.krd) – Kurdistan Regional Government Prime Minister Nechirvan Barzani concluded a two-day visit to Baghdad after meeting top Iraqi leaders. During his talks in Baghdad, the Prime Minister reiterated his government’s position to solve all outstanding issues between Erbil and Baghdad through dialogue. Prime Minister Barzani and his accompanying delegation on Monday met Iraqi Prime Minister Haider Al-Abadi. The war against terrorism, especially the expected operation to liberate the city of Mosul, oil issue, bilateral ties, future relations and arrangements were discussed during the meeting. Prime Minister Barzani and his delegation today met Iraqi President Fuad Masoum. The Prime Minister briefed President Masoum on the outcome of his talks with the head of the Iraqi government. Mr. Barzani later met the Speaker of Iraqi Parliament Saleem Al-Jubori and a number of senior Sunni politicians. Both sides highlighted the importance of Sunnis’ participation in the operation to librate Mosul from the so-called Islamic State terrorist organisation. During his visit to Baghdad, the Kurdistan Region delegation also met the United States envoy to Iraq, and leaders of Iraq’s main political parties. Erbil, Kurdistan Region, Iraq (cabinet.gov.krd) – Prime Minister Nechirvan Barzani received the US Senator John Cornyn (R-TX) and his accompanying delegation. Senator Cornyn highlighted the role of Kurdistan Region Peshmerga forces in the fight against terrorism and thanked, on behalf of the American people, the Kurdistan Regional Government for having accommodated and offered assistance to a large number of displaced persons and refugees who fled ISIS violence. He also discussed the anticipated operation of liberation of the city of Mosul from ISIS. In this regard, he stressed the need for a solid coordination between Erbil, Baghdad and the coalition forces and easing the concerns of the Sunni parties and the people of Mosul that everyone’s rights would be secured. He called for further support from the international community to the Kurdistan Region, which is expected to receive a further large number of displaced persons during the expected operation of liberation of Mosul. Prime Minister Barzani thanked Senator John Cornyn for his visit and pointed out that the Kurdistan Region has always been sheltering victims of oppression. However, he said, the Region’s resources are limited and the international community, particularly the United States, needs to increase its support to the Region. He expressed his appreciation and gratitude to coalition countries, especially the United States, for their military support to the Kurdistan Region since the start of ISIS attacks in 2014. On the relations between Erbil and Baghdad, Prime Minister Barzani pointed out that the Kurdistan Region is ready to settle all the issues with Baghdad through dialogue. He said that, militarily, it is expected to hold several meetings soon between the two sides with the aim to increasing cooperation. He added that there must be a clear vision on Mosul’s future political, security, humanitarian, social and reconstruction conditions. Prime Minister Barzani noted that the Peshmerga forces have recently marked significant victories on the outskirts of the city of Mosul and opened several fronts for the liberation of the city and the rest of the areas that are still under the control of ISIS. The two sides also exchanged views on regional political developments. Erbil, Kurdistan Region, Iraq (cabinet.gov.krd) - Kurdistan Region President, Masoud Barzani, arrived Turkey on an official visit to meet a number of Turkish senior officials. On Tuesday President Barzani met Turkish President Recep Tayyip Erdogan and Prime Minister Binali Yildirim. He is accompanied by Kurdistan Regional Government Spokesperson, Safeen Dizayee and Kurdistan Region President’s Chief of Staff, Dr. Fuad Hussein. In a statement to the KRG website, Mr. Dizayee said the aim of the visit is to exchange views on the latest developments in the region. The war against Islamic State terrorist organisation, ISIS, the anticipated operation of Mosul liberation, and the internal situation in the Kurdistan Region were discussed in the meetings. Mr. Dizayee said that the two sides stressed the development of relations between Kurdistan Region and Turkey. Today, President Barzani is due to meet the Speaker of the Turkish parliament and a number of members of parliament, including Kurdish parliamentarians. Erbil, Kurdistan Region, Iraq (cabinet.gov.krd) – Kurdistan Region Prime Minister Nechirvan Barzani received Kuwait’s outgoing ambassador to Iraq Mr. Ghassan al-Zawawi, accompanied by Kuwaiti Consul in Erbil. Ambassador Al-Zawawi said that his visit is to bid farewell to Prime Minister Barzani and thank him and his government for their support to the Embassy and Consulate of Kuwait in Baghdad and Erbil. He stressed that his country’s consulate in Erbil can play an important role in developing further the bilateral relations between Kuwait and the Kurdistan Region. Prime Minister Barzani thanked Ambassador Al-Zawawi for his visit and wished him success in his new position. He expressed his wish for further strengthening bilateral relations between the Kurdistan Region and Kuwait in all the fields. The two sides also exchanged views on the situation in the Kurdistan Region and Iraq, as well as the war against terrorism. 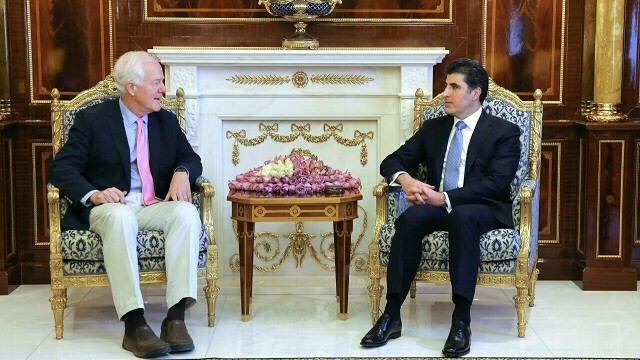 Erbil, Kurdistan Region, Iraq (cabinet.gov.krd) – Kurdistan Region Prime Minister Nechirvan Barzani met with the new German ambassador to Iraq Franz Joseph Crimp and his accompanying delegation. Ambassador Crimp expressed his happiness to observe the prevailing stability in the Kurdistan Region, for which he highlighted the role of its people, government and Peshmerga forces, who have been able to protect the Region against terrorism. He reiterated that his government will continue supporting the Kurdistan Region in the military and humanitarian fields, and expressed willingness to develop further and strengthen the relations between the two sides. Prime Minister Barzani thanked Ambassador Crimp for his visit and expressed his gratitude for the German government, as part of the international coalition forces, for its support and assistance to the Kurdistan Region in difficult and challenging periods at both military and humanitarian levels. The two sides exchanged views on the political situation in Iraq, the anticipated liberation of Mosul and its aftermath, and the economic situation in Kurdistan Region. Erbil, Kurdistan Region, Iraq (cabinet.gov.krd) – Prime Minister Nechirvan Barzani received Dutch Prime Minister, Mr. Mark Rutte, accompanied by a military and diplomatic delegation. Prime Minister Rutte praised the role of the Kurdistan Region Peshmerga forces in the fight against terrorism, reaffirming that his country would continue its military support to the Peshmerga forces. He also commended the people and government of the Kurdistan Region for having accommodated a very large number of displaced people fleeing the violence of Islamic State terrorist organisation, ISIS. He stressed that his country is trying, along with all European countries to obtain further humanitarian aid to the Region. Prime Minister Rutte expressed his hope for the development of relations between the two sides in various fields, particularly in the agricultural sector, noting that the Dutch consulate can play an important role in this regard. Prime Minister Barzani thanked Prime Minister Rutte and his delegation for their visit and expressed his gratitude for their country’s humanitarian and military support to the Kurdistan Region. He discussed the current challenges facing the Kurdistan Region, including the war against terrorism, accommodation of very large numbers of displaced people and refugees, and a severe financial crisis. The Kurdistan Region, he said, expects from its friendly countries to help overcome these problems. Prime Minister Barzani pointed out that with the start of the Mosul liberation military operations, it is expected that a large number of civilians will flee the city and take refuge in the Kurdistan Region. Offering assistance to further large numbers of displaced people, he said, is beyond the Kurdistan Regional Government’s capacity. He called for an increase in the humanitarian aid provided by the international community to the Region. Prime Minister Barzani expressed his government’s willingness to develop bilateral relations in all the fields, particularly in the agricultural sector. The two sides also exchanged views on relations between the Kurdistan Region and Baghdad. Prime Minister Barzani reiterated his position that all the outstanding issues with Baghdad should be resolved through dialogue. Erbil, Kurdistan Region (dfr.gov.krd) – The Department of Foreign Relations today hosted a special session for the KRG Board of Environmental Protection and Improvement and the Iraqi Kurdistan Mine Action Agency to brief diplomats on their activities, challenges, and needs. Minister Falah Mustafa, Head of the KRG Foreign Relations, opened the session by welcoming the diplomats and representatives of the UN agencies and international organizations. The Minister stressed that environmental protection and land mine clearance have always been on the agenda of the KRG and hoped that the session would open lasting channels of communication and cooperation between the two KRG institutions and the foreign representation offices in Kurdistan. Head of the KRG Board of Environmental Protection and Improvement, Mr. Abdurrahman Hama Raza, gave an overview of the state of the environment in the Kurdistan Region and KRG’s efforts to implement environmental protection measures and improve environment. Mr. Hama Raza highlighted the needs and challenges of the Board and called for technical assistance in order to implement the necessary measure required for securing a clean and safe environment. Mr. Hama Raza’s remarks were followed by a presentation in which the activities of the Board were presented. Head of the Iraqi Kurdistan Mine Action Agency (IKMAA), Mr. Mohammed Ismael, briefed diplomats on the formation, structure and the mission of IKMAA. He spoke of the challenges facing the IKMAA, the difficulties facing the Agency to defuse improvised explosive devices (IEDs) in the areas liberated by Peshmerga forces, and the need for international support. Mr. Ismael called upon the international community to help IKMAA clear the remaining minefields in the Kurdistan Region and to demine the areas liberated from ISIS so that the displaced people would return to their hometowns. On behalf of the diplomatic corps, the Consul General of Jordan, Haitham Abu Alfoul, who serves as the acting dean of the diplomats, commended KRG’s efforts in protecting the environment and clearing land mines in the Kurdistan Region, stressing that environmental protection and landmine clearance is a shared responsibility. During the meeting, several diplomats and representatives exchanged their views on the activities of both institutions and expressed readiness to look into the means and ways of supporting the KRG Board of Environment and IKMAA. Erbil, Kurdistan Region, Iraq (cabinet.gov.krd) – The Kurdistan Regional Government Council of Ministers marked the second anniversary of the genocidal act committed against Yezidi Kurds by the Islamic State terrorist organisation, ISIS, in Sinjar and its environs. In a ceremony today the staff of the KRG Council of Ministers observed a moment of silence to pay tribute to the victims of Sinjar genocide. In a speech, KRG spokesman, Safeen Dizayee, once again condemned this crime, hoping that this deep pain will be soon eased. In a statement to the KRG website, Mr. Dizayee said the Kurdistan Region will mobilise all its means to reconstruct Sinjar and other areas destroyed by ISIS terrorists. He also stated that the Kurdistan Regional Government will continue its efforts to obtain international recognition of the crimes committed against Yezidi Kurds as genocide.